The all-new 2015 Subaru Legacy gets a complete remodel. What are three improvements that make it the safest mid-size sedan on the road? The Subaru Legacy is celebrating its 25 year anniversary and the 2015 model is a good example of why the Japanese automaker is looking at its 6th consecutive year of record sales. Subaru introduced the all-new 2015 Legacy sedan in February at the Chicago Auto Show 2014 and the new flagship sedan was a big hit with critics and fans who liked the new exterior styling. There is a lot to like about the new Legacy, and this week we got to take the new sedan for a 500 mile test drive. We are testing the top of the lineup 2015 Legacy 3.6R Limited model ($29,595) that comes with a Moonroof Package $(2,990) that includes Keyless Access and Push Button Start plus Navigation. There are three improvements on the new flagship that impressed us the most. 2015 Legacy has undergone a complete remodel for 2015 and gets a number of new high-tech goodies, safety features, improved fuel economy and extensive quietening revisions. It also gets a new exterior remodel for the 25th anniversary model. Nothing was left untouched on the new-generation Subaru flagship sedan except the 3.6-liter engine. The 2015 Legacy “echoes” design themes introduced by the Legacy Concept and gets sleeker and sportier than the outgoing 2014 model. What is different? 2015 Legacy gets a sleeker coupe-like profile and features what Subaru calls a “nosecone” front section that combines the grille and bumper into one smooth piece. It also features a new aluminum hood for the first time. What’s significant about the new hood, is aluminum will reduce weight over the front wheels, enhancing steering response. This will work in concert with the new quick-ratio electric power-assisted steering that delivers a new feel and also contributes to reduced fuel consumption. The 2015 Legacy maintains a footprint similar to the outgoing model but gets a new acoustic windshield that is more raked, and pulled forward 2.0 in. at the base. The new windshield angle, higher seating hip points, new front partition windows and door-mounted side view mirrors will help improve visibility. The new-generation Legacy gets sleeker and slippier through the air. A 10-percent improvement in aerodynamic efficiency contributes to lower fuel consumption. All 2015 Legacy 2.5i trim levels will debut with a standard Active Grille Shutter system, which helps to improve fuel economy by reducing wind resistance when closed. Legacy 3.6R Limited comes with new standard HID low-beam headlights that give the car a more distinctive nighttime signature similar to some European model sedans. All Legacy models feature U-shape tail and brake lights and use LED bulbs for lower power consumption and a more luxurious appearance. This Limited tester featured turn signal exterior mirrors, which are available as an option on Premium models. As soon as we sat in the new 2015 Legacy, we could see and feel the upgrades made to the upmarket interior. Subaru used extensive soft-touch materials throughout and the fit and finish is top drawer. Subaru says the 3.6R Limited offers the highest level of luxury ever offered in a Legacy and it shows. On the outside Limited comes with 18-inch alloy wheels, Blind Spot Detection, Lane Change Assist, Rear Cross Traffic Alert and HID headlights. Inside, this Limited tester came with comfortable perforated leather upholstery, two-position driver's side memory, heated front and rear seats, rear seat climate control vents, and a harman/kardon 576-Watt- equivalent audio system with 12 speakers. The Limited's 7-inch touch screen display with multi- touch control offers swipe, scrolling gesture control, voice-activated controls, SiriusXM, SMS text messaging, iTunes tagging and dual USB ports. The interior volume has increased to best-in-midsize sedan segment levels (104.6 cu. ft.) and it gets a larger capacity (15 cu. ft.) trunk. Keep in mind this the top model Limited, but it’s by far the most comfortable Legacy Subaru has offered. The all-new backup camera was welcomed this week as we parked in various spots throughout the week. The cabin feels spacious and the rear offers a standard 60/40 carrying capacity and split-fold rear seats. This week we took two large guys to lunch and they were impressed with the room in the backseat. I didn’t have to move my seat forward from my normal driving position. They liked the rear seat climate control vents that kept them cool in the 90 degree heat that day. 2015 Legacy features new smaller front pillars. They are thinner and new glass in front of the side windows is now used to improve driver visibility. Subaru also moved the side mirrors back for greater side view visibility. We could tell this week that it was easier to see surrounding traffic as we traveled in the Denver metro area. It’s the little things that can make a big difference in driver safety and enjoyment. The new Rear Cross Traffic Alert that detects vehicles approaching from a perpendicular direction while reversing, came in handy in a couple driving situations this week as we pulled out of a driveway and a blind parking lot space. The new EyeSight safety system also came into play as we approached an intersection. The Legacy’s new-generation EyeSight safety system is located high on the windshield and detected a car that had come to a complete stop while turning in front of me. The EyeSight detected the car and automatically applied the brakes. The new safety system is located there to enable it to better see red tail lights on vehicles stopped ahead and it works well. It’s also strategically located on the windshield to keep it free of ice and snow during the winter months. Most automakers have the sensors located on the front bumper where they can become covered with dirt, ice and snow and become useless until cleaned. Legacy’s windshield wipers automatically keep the sensors clean with every swipe keeping the safety system working at peak efficiency. It’s also located there to reduce replacement costs in the case of a minor collision of the front bumper. Other new safety features include new front seat-cushion airbags that keep occupants in place during frontal collisions, bring the total airbag count to eight on the new sedan. Out on the road, the first thing we noticed as we got up to 75 mph on I-70 was the quiet cabin. Legacy now comes with a new acoustic windshield and received extra foam insulation and floor damping material to quiet the ride. The new model also gets liquid-filled engine mounts, thicker panels in the floor, toeboard, rear wheel apron and inner fenders. I could definitely tell the difference is noise level over the outgoing model. Even though Legacy is all-new for 2015, Subaru did not touch the Limited’s 3.6-liter 6 cylinder engine. It produces the same 256 horsepower and 247 lb-ft of torque. The 3.6-liter powerplant has plenty of power in all driving situations and was powerful at altitude as we climbed I-70 into the mountains west of Denver. What is new for 2015 is the Lineartronic CVT automatic transmission. 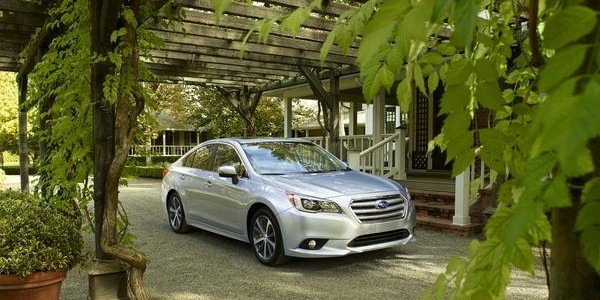 Subaru engineers were able to reduce friction in the CVT that contributes to higher fuel efficiency in the 2015 Legacy. The new CVT includes a six-speed manual mode and steering wheel paddle shifters. 3.6R gets a new CVT using a high-torque version that helped the 3.6-liter six-cylinder get a 10 percent increase in fuel mileage over the outgoing model and it runs on regular 87 octane unleaded fuel. The 6-cylinder 3.6R Limited model has EPA estimated fuel mileage ratings of 20 mpg city / 28 mpg highway / 23 combined. We were impressed with the smooth shifting automatic transmission that didn’t wind up like other CVTs. Subaru has done a good job of increasing both driving dynamics and increasing fuel mileage with the new gearbox. The new transmission essentially mirrors a broad range of gearing for maximum mileage, and is programmed to deliver noticeable "shifts" to make it feel more like a traditional transmission. Legacy also features a Start Assist and electronic Hill Holder System that holds the vehicle in place until the driver applies the throttle. The new sedan offers a more comfortable ride as we traveled over rough spots and the dirt road leading to my house in the mountains. This is due to the new MacPherson strut front suspension and double-wishbone rear suspension setup. It also gave the new Legacy nimble and sporty driving dynamics in the corners with very little body roll. Of course we would be remiss if we didn’t mention the core value that sets Legacy apart from the competition. That would be Legacy’s standard Symmetrical All-Wheel-Drive system. It was able to keep all wheels firmly planted even as we drove it hard in the tight mountain corners. The new standard Active Torque Vectoring and electric power steering also helped as we pushed the new sedan hard to see how it would handle the curves. Active Torque Vectoring is an enhancement of the Vehicle Dynamics Control (VDC) stability and traction control system. It fosters more neutral cornering by applying brake pressure to the inside front wheel. The new flagship was able to handle every driving situation we threw at it this week. If you want a cushy ride, you should look elsewhere. The Legacy offers a stiffer ride than the competition, but the trade off is a higher level of performance on the fun-to-drive meter. The new 2015 Subaru Legacy has undergone a complete remodel and gets a number of new high-tech goodies, safety features, improved fuel economy and extensive quietening revisions. It comes standard with Subaru’s excellent all-wheel drive system making it an ideal all-weather vehicle. What impressed us most this week, was the new Legacy’s level of safety with improved visibility, Rear Cross Traffic Alert and it’s standard new-generation EyeSight safety system making it the safest new mid-size sedan on the road. Other 2015 Subaru Legacy stories of interest.